WASHINGTON (CNN) -- Heeding warnings from a congressionally mandated commission, two U.S. senators introduced a wide-ranging bill Tuesday to address the threat of a biological attack on the U.S. homeland. Sen. Joe Lieberman, Sen. Susan Collins and former Sen. Bob Graham introduce the measure Tuesday. The bill, introduced by Sens. 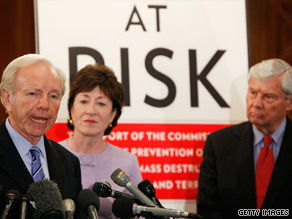 Joe Lieberman, I-Connecticut, and Susan Collins, R-Maine -- the chairman and ranking member of the Senate Homeland Security Committee -- would strengthen security at labs that handle dangerous pathogens and take other steps to prevent or respond to a terrorist attack. "The fact is, we are still not properly prepared to meet this bioterrorist threat, despite the 2001 anthrax attacks," Lieberman said. The bill would implement many of the recommendations of the Commission on the Prevention of Weapons of Mass Destruction Proliferation and Terrorism, an outgrowth of the September 11 Commission. In December, the commission issued grim predictions in a report titled "World at Risk." The commission said that unless the world acts decisively, it is "more likely than not" that terrorists will use a weapon of mass destruction "somewhere in the world" by the end of 2013. A biological attack is more likely than a nuclear attack, the report said. Lieberman said the legislation would enact the commission's recommendations and provides a "comprehensive framework" for protecting the country from attacks using weapons of mass destruction in general and biological attacks in particular. • Labs working with deadly pathogens would have to increase security. Grants would offset security costs. • Police and firefighters would be provided with medical kits so they could quickly respond to WMD attacks while protecting themselves and their families. • The U.S. Postal Service would expand its program to distribute medicine and supplies to five additional cities within one year and 15 additional cities within two years. • A National Bioforensics Analysis Center would be created to identify those who launch biological attacks. Former Sens. Bob Graham of Florida and Jim Talent of Missouri, who headed the WMD Commission, endorsed the legislation. "This is a critical step," Graham said. "The clock is not our friend." Lieberman said he would like to move the bill to a committee "sometime this fall" and hopes for Senate passage by year's end. There is currently no corresponding House legislation. Collins said people sometimes focus on nuclear threats while ignoring more likely threats. "The mental images of mushroom clouds and nuclear blasts are powerful and frightening. But as the Graham -Talent Commission rightly notes, the more likely terrorist threat is from a biological weapon," Collins said. "In contrast to nuclear weapons, the technological hurdles are lower to develop and disseminate a bio-weapon." At Tuesday's news conference, Graham said the government still needs to address nuclear threats. He said the commission recently wrote to President Obama, recommending that Vice President Joe Biden be named to lead efforts to end the proliferation of nuclear weapons. "To date, there has not been a definitive response to that request," he said. "We cannot tolerate this continuation of having non-proliferation treated as the disposable issue on the American agenda, or we are going to pay a horrendous price," Graham said.